It’s Day 1 at South by Southwest Education (SXSWEdu), and already I’m feeling the buzz. There’s a great conference room in the Austin Convention Center, complete with a super-size front projection data screen, stage set lighting, with a great music mix setting the mood. Producton values are so important for a conference. Don’t I just want to love this event? Yes! First up is Alfred Solis, Director of New Media at the Buck Institute for Education. In the minutes before the program begins, I go online (free, no password needed – thank you!) to discover that this organization pioneered staff development in project-based learning since the 1990s. John Thomas wrote a review of the research evidence, which is also useful. What’s their secret? SIGNIFICANT CONTENT. The project is focused on important knowledge, concepts and skills derived from standards. 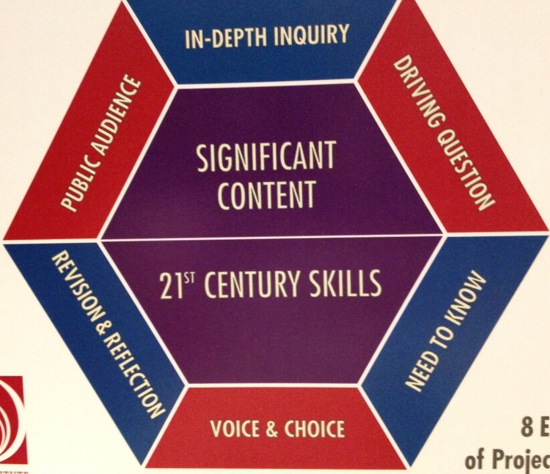 21st CENTURY SKILLS. Students build critical thinking, collaboration, creativity and communication and other skills needed for success in today’s world. DRIVING QUESTION. Project work is guided by an intriguing, open-ended question. NEED TO KNOW. The project creates an authentic purpose for learning, beginning with an Entry Event. VOICE & CHOICE. Students make some decisions about the project, including how they work and what they create. REVISION & REFLECTION. Students give, get, and use feedback to improve their work, and reflect on their learning. PUBLIC AUDIENCE. Students create products for or present work to people beyond their classroom. After introducing these concepts, participants were invited to watch a video, “Media Saves the Beach,” from High Tech High School in San Diego. After viewing, we reviewed how the eight elements were embodied in the video, with a partner. He then shows another video and asks participants to select from a multiple-choice list: What’s the driving question? I’m reminded of Ted Sizer and Grant Wiggins and the vibrant ongoing dialogue on the art of creating Essential Questions (EQ). Alfred Solis concludes by noting that public audience and public exhibition are a game-changer for schools. Culminating events require persuasive communication and marketing skills. What a nice crisp introduction to project-based learning!